A jihadi group occupying the Syrian town of Raqqa recently gave Christian minorities living there three choices: 1) convert to Islam, 2) remain Christian but pay tribute and accept third-class subject status, or 3) die by the sword. So why is the West, here in the “information age,” utterly if not abhorrently ignorant of the teachings of Islam? Because those responsible for making such knowledge available—specifically academia, media, and government—are more interested in whitewashing Islam and bemoaning Islamophobia (see pgs. 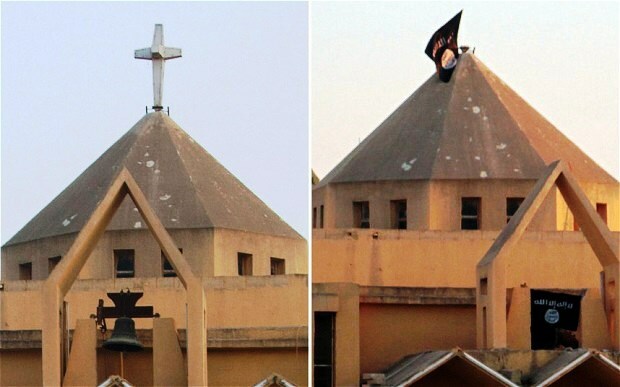 219-249 of Crucified Again: Exposing Islam’s New War on Christians for specifics). It was the same when I worked at the African and Middle Eastern Division of the Library of Congress, a governmental institution; there, our conferences regularly focused on the purported achievements of Islamic civilization. As for the endemic Muslim persecution of Christians—past or present—apparently only an “Islamophobe” would raise that topic up. And if the attempts to suppress the reality of Christian suffering under Islam by academia, media, and government were not enough, months and years back, when the plight of Syria’s Christians was becoming known, even random (but supposedly nonbiased and independent) think tanks and writers also tried to suppress it. Is it any wonder, then, that Christians in Syria being offered three choices—Islam, subjugation, or death—is mindboggling to the average person in the West, appearing as a wild aberration? Whereas Koran 9:29 provides divine sanction to fight the “People of the Book” (namely, Christians and Jews) “until they pay the jizya with willing submission and feel themselves subdued,” the lesser known Conditions of Omar (also known as the Pact of Omar) lays out in detail how they are to feel themselves subdued. Named after the second caliph, Omar bin al-Khattab (r. 634 to 644), the Conditions was purportedly agreed upon between the caliph and a community of Christians conquered by invading Muslims, ironically in the region of Syria. It has since been referenced in most major works on the treatment of dhimmis—non-Muslims living under Islamic authority. We guarantee all this to you upon ourselves, our descendants, our spouses, and our neighbors, and if we change or contradict these conditions imposed upon ourselves in order to receive safety, we forfeit our dhimma [covenant], and we become liable to the same treatment you inflict upon the people who resist and cause sedition. If the infidels live among the Muslims, in accordance with the conditions set out by the Prophet—there is nothing wrong with it provided they pay Jizya to the Islamic treasury. Other conditions are . . . that they do not renovate a church or a monastery, do not rebuild ones that were destroyed, that they feed for three days any Muslim who passes by their homes . . . that they rise when a Muslim wishes to sit, that they do not imitate Muslims in dress and speech, nor ride horses, nor own swords, nor arm themselves with any kind of weapon; that they do not sell wine, do not show the cross, do not ring church bells, do not raise their voices during prayer, that they shave their hair in front so as to make them easily identifiable, do not incite anyone against the Muslims, and do not strike a Muslim. . . . If they violate these conditions, they have no protection. From here, one can understand why all around the Islamic world Christians are under attack—their churches bombed, burned, or simply denied permits to exist or renovate, and their Bibles, crosses, and other symbols of “polytheism” confiscated and/or destroyed; why Christians who openly speak of Christianity are accused of proselytizing or blaspheming—both which can lead to execution; and why Christians are being forced to pay tribute or else convert to Islam or die. Thanks to Western intervention in the colonial era, the Conditions largely disappeared—not least because Muslim leaders and elites were themselves westernizing. But today, as Muslims turn back to their Islamic heritage and its teachings—not least because Western leaders and elites are urging them to, in the name of multiculturalism if not moral relativism, the Conditions are returning; and woe to the Christian minority who dares break them by exercising religious freedom—what I call the “How Dare You? !” phenomenon, which is responsible for the overwhelming majority of Islamic attacks on non-Muslims. Even so, thanks to the “progressive” dissembling of academia, media, and government—the supposed guardians and disseminators of truth and knowledge—such simple facts about Islam remain a great mystery in the West, to our own detriment.